Back to the present: if I remember right, Emily designed this modern version. All I did was help her with the construction. As you know from the previous post, we're spring-cleaning. While those halloween costumes aren't going anywhere (except to a different, less-crowded closet), a lot of our cardboard toys are going out to the recycling bin. This includes this guitar and that greengrocer shop. Don't scream, guys. I know that shop has fans among you, along with the entire eco-friendly internet community and some home-design sites but it's huge. Which our house isn't. So it's time to say goodbye, to make space for new cardboard architecture. I'm not as sad as I thought I would be. Anyway, back to this guitar. It was still in such good condition that I thought it was worth taking some photos of before we tossed it out. 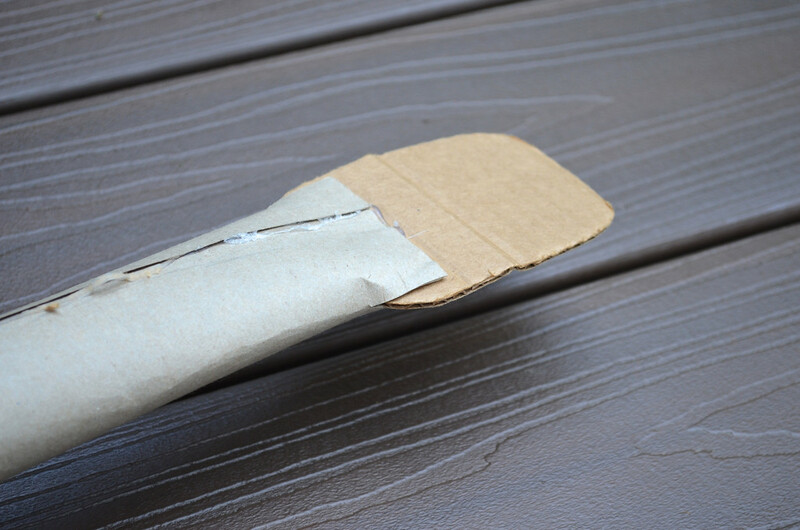 We started with a smallish cardboard box, with most of its top flaps cut away, leaving just enough material to glue on a guitar-shaped facade on top, with a hole in it. 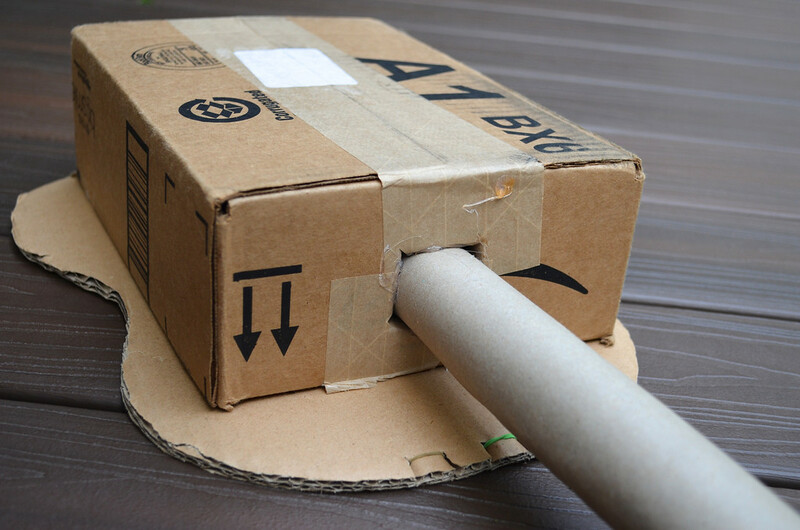 Then we rammed a cardboard tube (probably came from inside of a wrapping paper roll) into the top of the box for the neck. Notice that we didn't cut a circular hole for the tube. Instead, we cut an "x" and pressed in the flaps of the X to form a collar onto which glue could be applied to secure the roll to it. 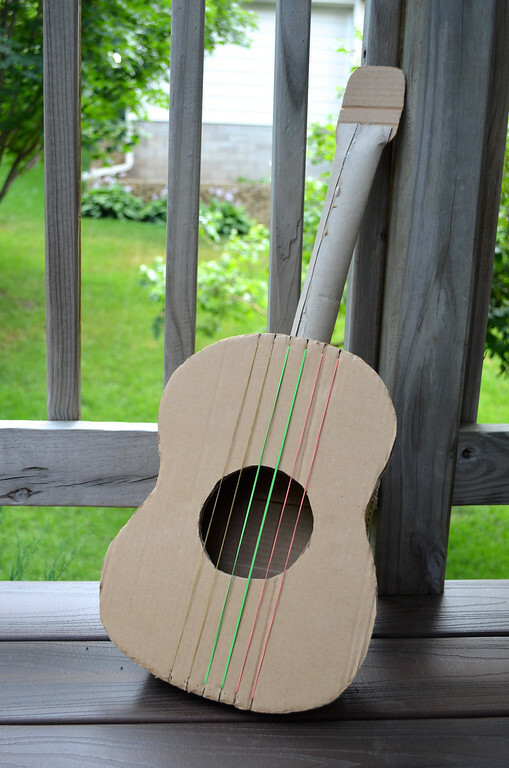 Then we cut short slits in the top and bottom of the guitar-shaped piece, to loop rubber bands around them for strings. 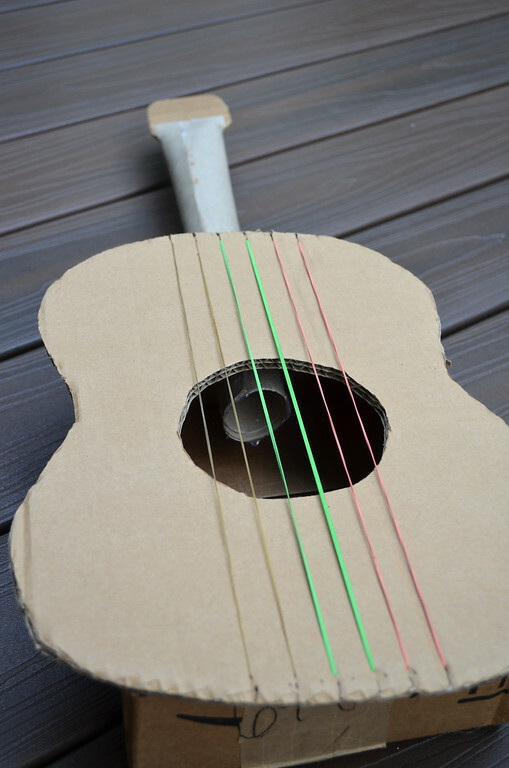 Note that the cardboard could fold and/or buckle under the tension in those taut strings/rubber bands. 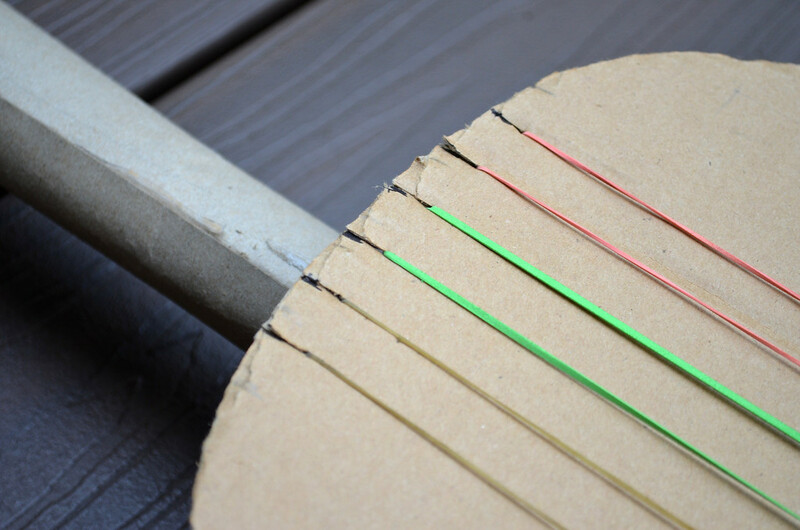 So make sure the flutes of the cardboard are parallel to the strings. See this post if you don't know what 'flutes' are. 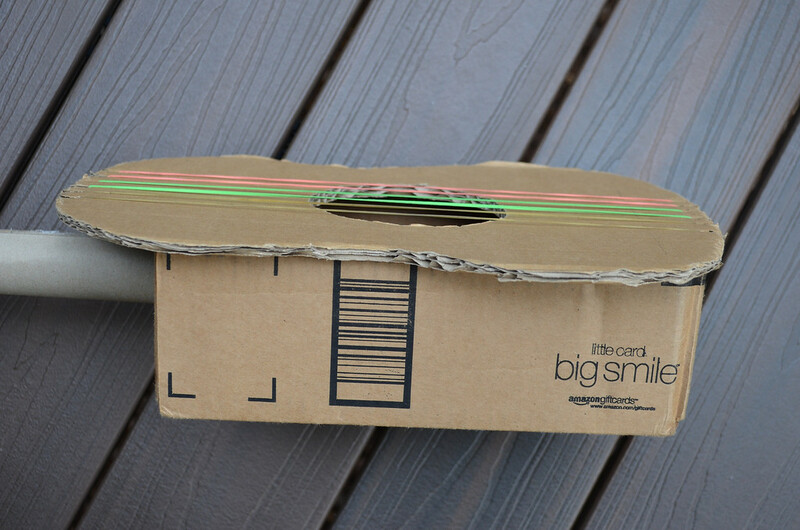 The head of the guitar was simply an appropriately-shaped piece of cardboard, slotted into the flattened end of the neck/cardboard roll. 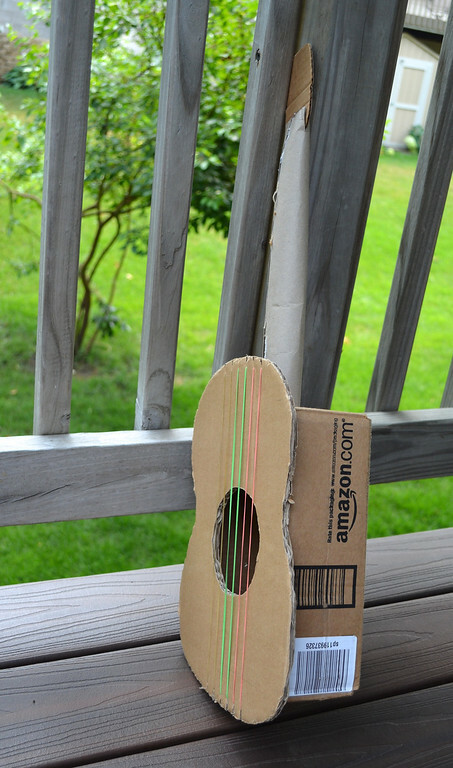 The amazon box we used provided a nice acoustic chamber for the rubber band strings. Both of those guitars are wonderful. I make mine with a tissue box and a couple of rubber bands. 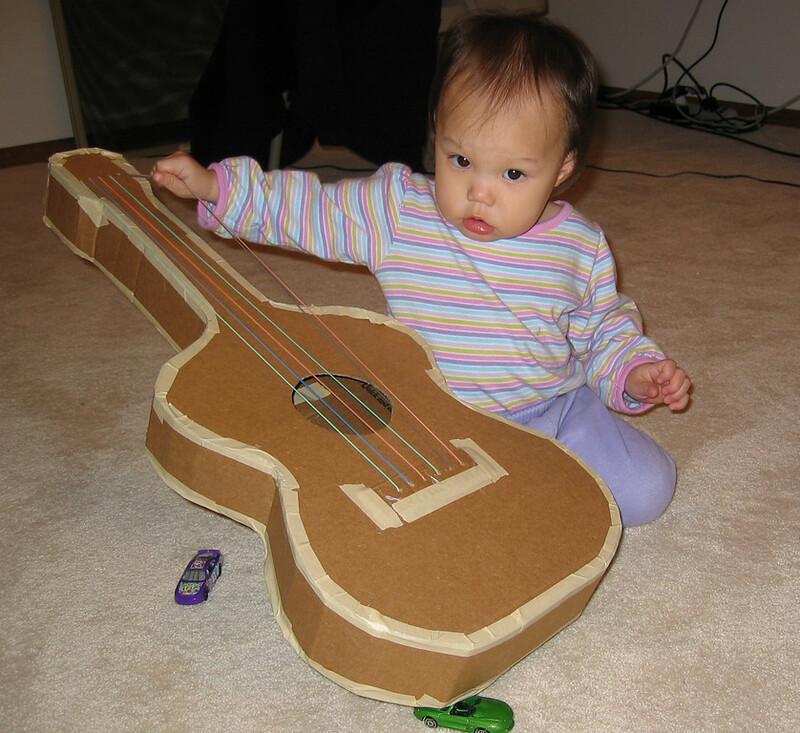 Think I might have to try harder to make my box guitars better!! 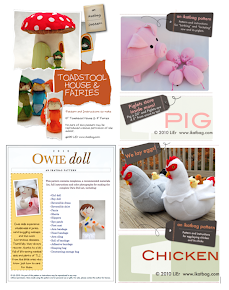 Couldn't you offer the cardboard toys to a daycare or offer up on Freecycle? I think someone else would LOVE to get them! 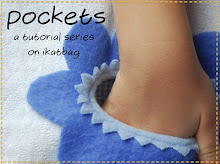 I really need to make one of these. My little guy is always asking to play his dad's guitar, and I often let him (with supervision), but it would be nice to have one that he could pull out whenever he wanted. Thanks for sharing! Wow, yes, freecycle those toys, they are treasures!